Cincinnati, OH – Nearby sounds of goats braying and cattle lowing are nearly drowned out by the din of commerce as visitors to the marketplace haggle. Vendor and visitor spar over the price of earthenware pots and handmade leather satchels. The next stall suddenly emits a puff of smoke and steam as sizzling kebobs – now deemed ready for sale and consumption – are removed from their grill. The layered aromas from the grill blend with the sweet-smelling hay in an attempt to mitigate the pungent haze from an incense vendor several stalls to the left. The din of the marketplace – complete with shekels changing hands and being deposited into deep pockets by robed vendors – could occur in any of hundreds of ancient markets. But it actually occurs each year in Texas City, Texas. For two nights each Christmas season, visitors to the gymnasium at Peace Lutheran Church are magically transported through thousands of miles and across time – giving them the opportunity to Journey to Bethlehem. The scenery depicts the town at the time of Christ’s birth and culminates with a live Nativity scene. The village is complete with shops manned by local artisans selling handmade ware such as pottery or baskets, or items including incense, papyrus scrolls, oils and foods native to the region. 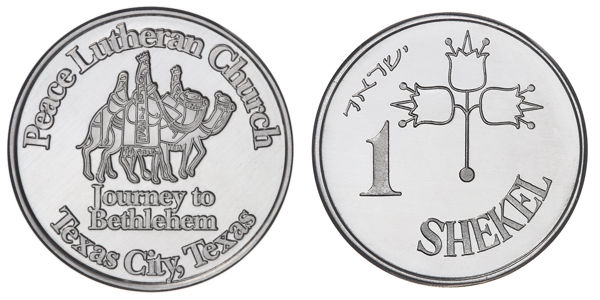 To allow shopkeepers to stay in character, all transactions are conducted using shekels – custom coins that the Church has minted every few years as the need arises – and which are exchanged before the journey begins. For many of the 1,000 or so visitors each year the “Journey to Bethlehem” has become a Christmas tradition. Some families have attended each year for the past two decades. Many like the authentic feel of the village and use the journey as a means of centering themselves mentally and spiritually during a hectic and chaotic time of the year. The authenticity of the scenery and wares really helps to set the mood, as does the use of shekels to facilitate the exchange of goods. Before entering the gymnasium, visitors are offered the opportunity exchange real money for shekels which they can spend at the 30 or so shops – at an exchange rate of 2 Shekels to the dollar. Some of the original coins are still in use. Having coins of varying ages and conditions lends an aura of realism. New coins are purchased as needed to replenish the supply. Because the coins are re-used year after year, the only reasons to replace them are due to increased volumes, or if visitors carry them home at the end of the evening. Increased volume is certainly good as it means that more people are attending and purchasing wares. And since proceeds from the event help to fund the coming year’s live Nativity scene, increased volumes are welcome. Even the “walkaway” coins can be beneficial, as the shekels serve as a reminder of the event each time that they are seen with pocket change. Elfstrom purchased the most recent batch of coins from Cincinnati’s Osborne Coinage Company – a referral from Our Lady of Lourdes Church in a nearby Hitchcock, Texas. There are certainly many live nativity scenes and other Christmas events designed to help visitors re-focus spiritually during what can be a hectic time. The Journey to Bethlehem is unique in the level of detail and the authenticity. From the live Nativity beneath the Bell Tower, winding through the shops and stalls, the detail and precision create a look and feel which helps visitors to imagine themselves in an ancient market. As they trade shekels for handmade pottery, era-specific incense and native foods, it is easy for visitors to imagine a robed traveler leading a donkey which carries his pregnant wife. Of all the images which Ellfstrom and the team so painstaking try to re-cerate with their Journey that image is the one which they hope stays with their visitors long after the tents have been packed for another year. Maybe seeing a leftover shekel with pocket change at the grocery will help to fan the flame of that memory.